Deutsch: Sir Philip Anthony Hopkins, CBE (* 31. Dezember 1937 in Margam, Port Talbot, Wales) ist ein in den USA lebender walisischer Schauspieler und Oscar-Preisträger. English: Sir Philip Anthony Hopkins, CBE (born 31 December 1937 in Port Talbot, Glamorgan), is an Academy Award winning Welsh actor of film, stage and television. 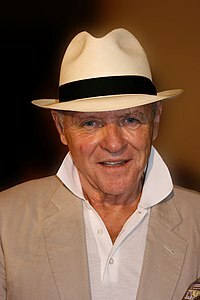 Español: Sir Philip Anthony Hopkins CBE (n. 31 de diciembre de 1937, Gales) es un actor de cine, teatro y televisión galés. Français: Sir Anthony Hopkins CBE, de son nom complet Philip Anthony Hopkins, est un acteur britannique naturalisé américain, né le 31 décembre 1937 à Margam, près de Port Talbot au Pays de Galles. Italiano: Sir Anthony Philip Hopkins (Margam, 31 dicembre 1937) è un attore cinematografico e attore teatrale britannico. Nederlands: Philip Anthony Hopkins (Margam, Port Talbot, West Glamorgan, Wales, 31 december 1937) is een Welsh acteur. Polski: Sir Philip Anthony Hopkins (ur. 31 grudnia 1937 w Port Talbot w Walii), brytyjski aktor teatralny i filmowy. Português: Sir Philip Anthony Hopkins, CBE (Port Talbot, 31 de Dezembro de 1937) é um premiado actor britânico nascido no País de Gales. Suomi: Sir Philip Anthony Hopkins (s. 31. joulukuuta 1937 Margam, Wales) on brittiläissyntyinen näyttelijä. Svenska: Sir Philip Anthony Hopkins, född 31 december 1937 i Margam, West Glamorgan, Wales, är en brittisk skådespelare. Русский: Сэр Фи́лип Э́нтони Хо́пкинс (англ. Philip Anthony Hopkins; род. 31 декабря 1937, Порт-Толбот (ныне графство Нит — Порт-Толбот), Уэльс, Великобритания) — выдающийся британский актёр театра и кино, режиссёр. Pages in category "Anthony Hopkins"
Media in category "Anthony Hopkins"
This page was last edited on 26 August 2018, at 08:00.